Castle Tattersall Shirt has a classic and traditional check pattern design, the mix of neutral and natural colours makes it perfect for both work and leisure. Light weight polyester cotton mix makes for a durable material that will keep you warm when needed but also cool when required. The shirt features a single breast pocket, perfect for keeping your pencils whist working away, the pleated back makes for a comfortable fit. 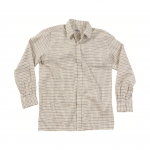 Like this Castle Tattersall Shirt? Why not check out our other Castle products?